It only takes a few minutes of highlight footage to distinguish the scientist from the artist. In the parlance of the sweet science, one corner envisions the confrontation in a series of highly choreographed tactical moves embodied by perhaps one of the most gifted technicians in boxing. In the other corner however, is an unpredictable beast that manages to keep even the most seasoned of boxing experts in awe and have them constantly guessing of what comes next. The result of these contrasting styles is an unpredictable and exciting melange of fists and fury over the stretch of twelve rounds. Nothing can be more contrasting when speaking of the personal temperaments of each fighter. Manny Pacquiao, the Congressman from the Philippines is the personification of resilience and quiet confidence. With an easy smile and almost childish laugh that seems to come with the slightest provocation Pacquiao seems to take life as it comes. Or as they say in boxing, he simply rolls with the punches. Given his impoverished and difficult childhood one can see how he has become the resilient man that he is today. Growing up poor in a developing country like the Philippines has a completely different meaning when compared with being poor in an industrialized country like the United States. In the states to say that you are poor may mean that you only have a small tv, a fridge and an old car but can still have a couple of meals each day and go to public school and hospital if necessary. To say that one is poor in the Philippines can easily mean that the most food you’ll have on the table is a carefully rationed cup of rice and some soy sauce. You can forget about owning a refrigerator, a television or a car for that matter. Such are the conditions that can easily break a man’s spirit but when you are surrounded by a community who shares a similar situation as you do it breeds resilience and awakens the survivalist in us. But every now and then a select few develops an audacity to dream beyond the rationale of reality and somehow finds a way to thrive. Such an individual transcends his difficult reality and becomes an artist. Meanwhile in Michigan, the Mayweathers have quietly been building their own legacy in the sweet science of calculated violence for the past few decades. Floyd Sr. and younger brothers Roger and Jeff’s penchant for competition became the grindstone that sharpened their considerable skillsets. Floyd Jr. practically spent his entire life in the boxing gym surrounded by his father, uncles and other professional boxers actively and passively learning the fundamentals of the sweet science. From his early fights as an amateur one can easily recognize the fruits of his lifelong exposure to the nuances of boxing. If one were to author a book on the fundamentals of modern boxing techniques it would be inconceivable to see a figure other than Floyd Jr.’s due to his mastery of virtually every technique of orthodox boxing. It’s equally as easy to imagine him being the face of American boxing when he has been groomed to become a professional boxer not only with techniques but also in showmanship. Such are the stuff that personifies the classic American boxer. 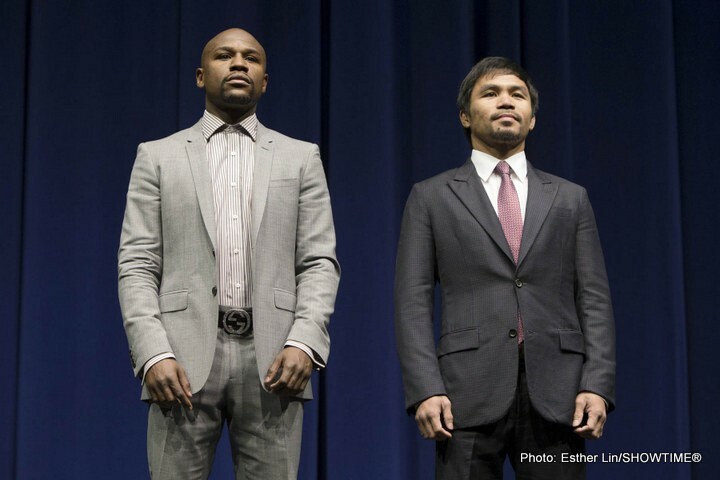 On May 2nd the world will witness Manny Pacquiao and Floyd Mayweather Jr. in a square circle surrounded by well-heeled and well-connected individuals as they battle for pugilistic supremacy. Once and for all, perhaps we can also determine whether the methodology of science supersedes artistic creativity in the ring or whether artistry can outshine the rigors of science. I for one can not wait to find out the answer to this question, come what may.